The earliest centric barn in the United States was built by George Washington. He built a 16-sided barn in Fairfax County, Virginia. Thomas Jefferson built octagonal farm structures on his farm in Virginia in 1826. 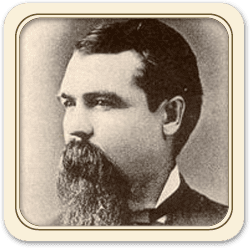 He was viewed as one of America’s first and finest architects. 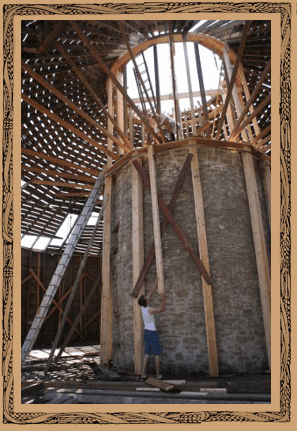 The round dairy barn structure is often referred to as an amazing and brilliant construction. Our round barn was built in 1903 by Lewis Lendborg (a Scandinavian builder living in Cottage Grove) for Herman Gangstad, a Norwegian settler. The design was influenced by Professor F.H. King (see photo left) of the University of Wisconsin-Madison. King, a professor of Agricultural Physics, promoted the round barn design as being economical, stable and efficient for use as a dairy barn. 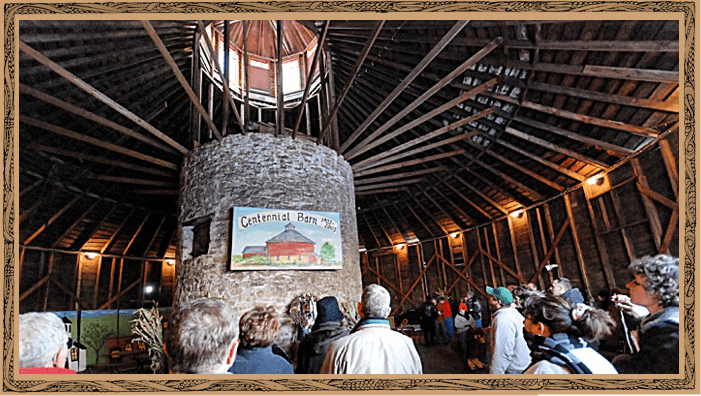 Our barn is the only round barn still standing in Dane County. The foundation of our round barn was built with limestone that was excavated from the farm. The barn is 60 feet in diameter with two-foot thick limestone walls. The barn contains a 12-foot diameter silo in the center with two-foot thick limestone walls. A wooden milk house is attached to the southwest section of the barn and a cattle shed, added in the 1950’s, is attached to the northeast section. The barn is standing today, because when the weather beat the barn the Gangstads did what was necessary to keep it standing and functional. In 1949, a strong windstorm caused severe damage to the barn. The big doors over the barn bridge had been left open about two yards and the wind got in and went around the inside of the round barn. This twisted and broke rafters inside the barn and silo. It also twisted and tilted the barn on the foundation. The Gangstad family hired a man who put ropes and chains around the whole wood barn, fastened a tractor and horses to it and pulled it north. The barn twisted back in place and onto the foundation. The X bracing on the interior walls was added at that time. Had the doors been shut the barn would have likely exploded like the round barn just a 1/2 mile away that was destroyed during that storm. The second story of the barn was sided with aluminum in 1963 because the original wood siding had become deteriorated. “It was frequently in need of repairs as the boards and nails would spring loose, seemingly rebelling against the curve,” shared Eldora Gangstad (wife of Hamlin, Herman’s grandson). The roof was originally topped with a cupola and shutters (see photo left). 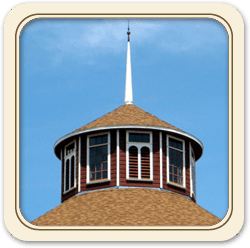 In 1967, the original cupola was struck by lightning, starting the wood spire on fire and cracking the silo. Thankfully the rain doused the fire but the silo was no longer usable for silage. Thus, the Gangstads converted their dairy barn of 54 years to a hog barn in 1968. For practical, economic reasons they chose to push the severely damaged cupola into the silo and sealed the roof like an upside down cone rather than repair/rebuild the cupola. From 1990 until 2006, the barn housed our menagerie of exotic and domestic animals. In 2004, this very special piece of architecture began to host celebrations of all kinds for our farm guests in the former hay mow (second floor). In 2007, the cone roof was stripped off and a new roof with a cupola (as the original roof had) was built. The fall of 2010 will mark a new adaptive reuse for the barn when the former animal housing level (first floor) begins to host thousands of school children and farm guests as they learn, through experience, about agriculture. We’re looking for Agricultural Artifacts for the Barn! Reminisce about past farming practices and learn how, as small scale farmers with specialty crops, we have learned to re-use old equipment to provide our customers with quality agricultural products. We are beginning to decorate the interior of the barn with agricultural artifacts of old. Come back year after year to see what new ”old” decor we”ve added. If you have any household or agricultural antiques you would like to have displayed in our barn with your family name and past uses, please contact us.